The Deputy Governor of Imo State, Prince Eze Madumere, has condoled Justice Kemakolam Ojiako and family over the passing of their patriarch, HRH, Eze (Justice) Gabriel Orjiako, one time Chief Judge of Imo State. 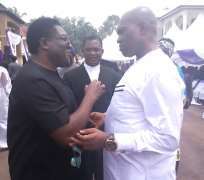 The Deputy Governor sent his condolences to the family while speaking to newsmen shortly after funeral service at the Christ the King Catholic Church, Abba, Nwangele local government area of Imo State. Madumere described later late Ojiako who was aged 86 as a great leader whose legacies would continue to inspire many generations to come. "As a great father, his fruits of great children, are there as evidence. As a legal luminary and Chief Judge, his legacy in the temple of justice, he was brave and an impartial judge are engraved in marble. As a Traditional Ruler, he ruled with dignity and through his leadership, so much positive development in his domain." He therefore admonished members of Ojiako family not to mourn like those who have no hope, saying that late Orjiako was a man ahead of his time who yielded to be a vessel in God's hand to impact on people's life. Speaking further: " I pray God to grant the family the fortitude to bear the irreparable loss while praying from the repose of the soul of the departed.